Where Cool Waters Flow is a book about canoe guiding culture around Grand Lake Stream, a town in northeastern Maine. First-person author Randy Spencer is interviewed here by Keith Shortall on Maine Public Broadcasting Network. Grand Lake Stream is where the Grand Laker canoe was born. 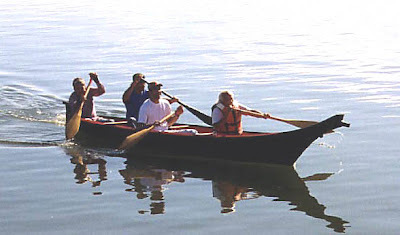 This is a large, square-stern, cedar-and-canvas canoe designed for use with a small outboard on the transom. I haven't yet read Where Cool Waters Flow, but it's on my reading list. 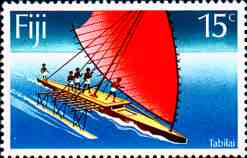 Many nations have issued postage stamps featuring dugout canoes. There's a whole page of them here. Some time ago, comments to my post about the Oceanic "five-part canoe" led to further posts about the Bronze Age boat found in Denmark known as the Hjortspring or Als boat. Basing my posts mainly on Bjorn Landstrom's illustration and description, I stated that Hjortspring was not much like the 5-part dugout of Oceania. Some months later, reader Edwin added a comment to the contrary to my original post about the Oceanic canoe. 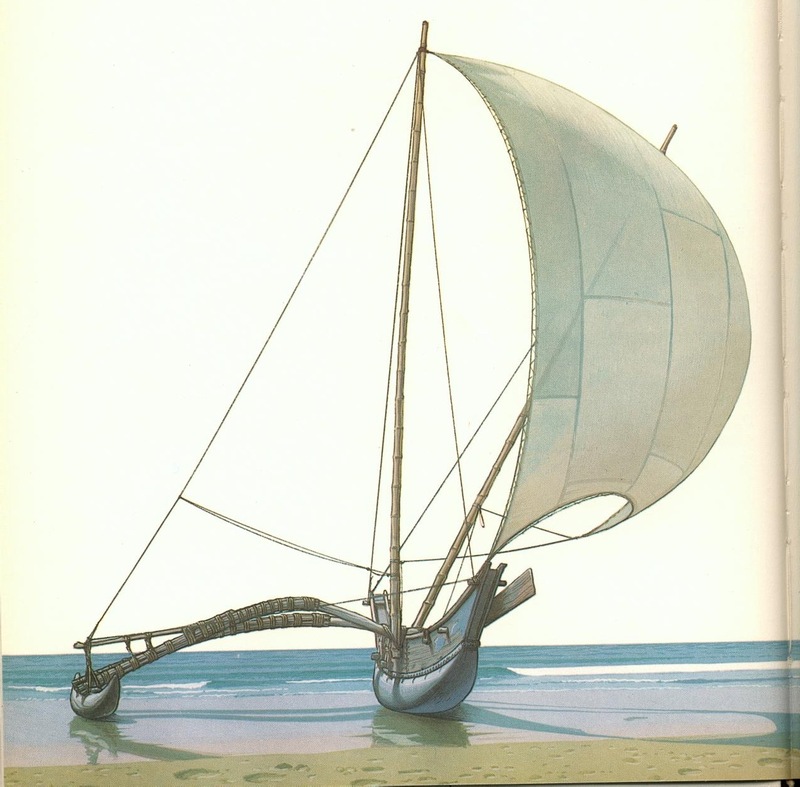 Having subsequently read Basil Greenhill's Archaeology of the Boat (discussed here), I found a good detailed illustration of Hjortspring's bow (shown above) which validates Edwin's comments. 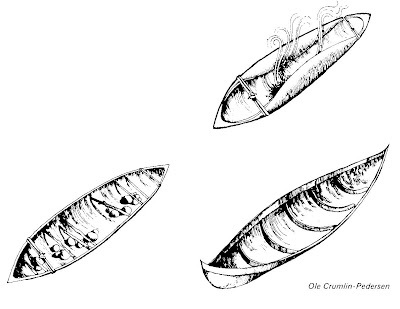 The bottom is indeed dugout-based, and the ends (labeled "stem piece" here) are quite like the crotch-pieces of Oceanic canoes in function (if you discount the unusual horn-like structures outboard of the crotches, that may be related to an earlier skin-boat ancestor). Where they differ is in the planks. 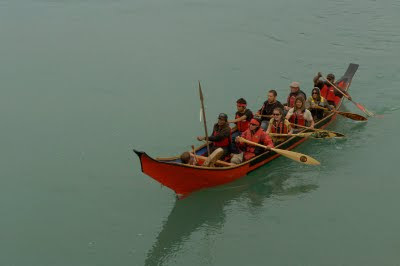 In the Oceanic canoe, the first set of strakes equals the height of the crotches, and occasionally a wash-strake is added to raise the sides. In Hjortspring, the first and second planks together equal the height of the crotch-piece. As is often the case in the five-part canoe, Hjortspring was sewn together. I've lately been reading the blog Paddle Making (and other canoe stuff) by Murat. It makes good reading and great viewing. Murat, a Toronto-based blogger, makes lovely paddles that sometimes transcend mere functionality and experiment with indigenous and/or historic designs and patterns, often interpreting those influences in modern and creative ways. What's different and refreshing is that many of these "art" paddles are not like the hokey, tacky paddles with paintings of wolves or trout on the blades. I've never seen anyone actually use one of those "illustrated" paddles, and if I did, I'd probably think the less of him. I mean, if you're out in the wilderness, why the hell do you need a picture of wildlife on your paddle? But if I saw someone using one of Murat's creations, I'd only admire it, the same way I might admire a nicely-made bark canoe actually being used. Murat doesn't confine himself to his own paddles, or to paddles at all, in his blog. He recently did a series of posts on the restoration of an old canvas canoe-pack, and he discusses other topics of interest to canoeists of a traditional or historical bent. I'm experimenting with a new Amazon Associates feature that makes it easy to insert product links into the body of a blog post. Feel free to comment if you think the Amazon link is intrusive, not a problem, or whatever. Thanks. Finally, this new Amazon feature seems to have made Blogger's spellchecker disappear. Until I find it again, please forgive typos. Thansk! Regarding my last post, reader Anton asked for more information on sailing sabanis -- specifically concerning the use of the multi-position mast step. 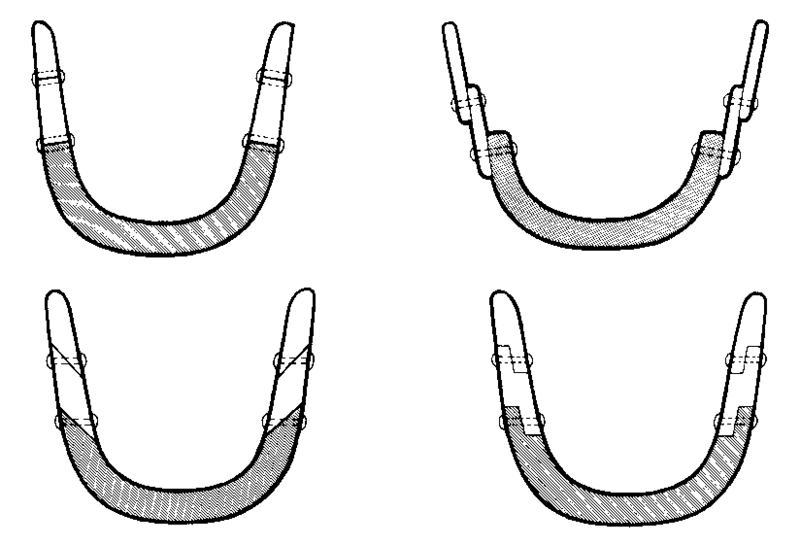 The following illustration, again from Shiraishi's booklet (see previous post), shows how, by stepping the mast the aft-most position, the sail's center of effort moves forward, and vice-versa for the step's forward position. How to mast or how to make sail differs according to the strength or direction of the wind. When the wind is not hard , the mast is set up vertically as shown in Fig. 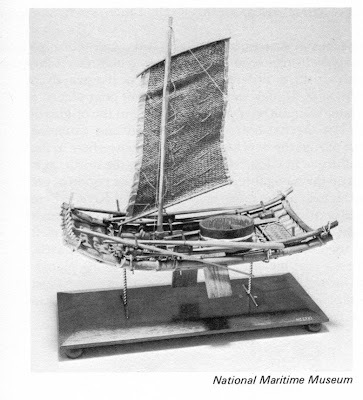 B and when the wind is hard, the mast is inclined towards the stern as shown in Fig. C, sometimes with the sail taken in a reef by one FUZAN's [i.e., batten's] length. Since the way to mast SABANI is not complicated it can easily meet the change of the winds. 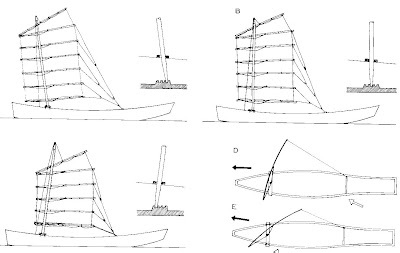 Quartering (MASUBI) is easiest for SABANI to sail, with its sail open as shown in Fig. 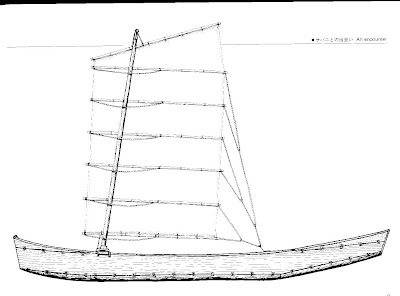 D.
Sailing with wind abeam or quatering (sic) is called USAGIBAI or USAGIBARASHI, then a skipper sits in the middle to draw the boat deep so as not to be driven sideways by the wind, as is shown in Fig. E.
Whew! Hard to make sense of that, aside from the interesting point about the skipper moving forward to try to increase the lateral plane when the wind's abeam. Considering that there's no built-in lateral plane (leeboard, keel, outrigger float, etc. ), one wonders how well sabanis go to windward. I also question the angling of the mast depending on the strength of the wind. I suspect that the real function of the multi-position mast step is to change the fore-and-aft location of the center of effort, as on a windsurfer, to aid in steering -- i.e., tilt the mast forward when heading downwind, and tilt the mast aft when heading upwind. Sabanis - Canoes or "Boats"? My last entry was a guest blog from Douglas Brooks, who is working on a sabani in Okinawa. He is maintaining his own blog of the project which makes good reading. Consider this post a complement to Douglas's blog. Whether the sabani is a "canoe" or not is debatable. On the pro side of the argument, it clearly evolved from a dugout canoe. The bottom is a massive cedar dugout, to which one side strake is added on each side (plus small partial strakes to raise the freeboard at the bow and stern. As Douglas Brooks noted, the strakes, too, bear a relationship to dugout practice, as they are not milled lumber, but hewed to shape. On the other hand, it seems wrong to call anything a canoe that features such massive construction overall, and its shape is hardly canoe-like -- more banks-dory-like in its half-breadths, while the fish-form plan view is unique. In the image below, the bow is on the left. The stern is considerably higher, to help the stern lift with following waves, according to Shiraishi. 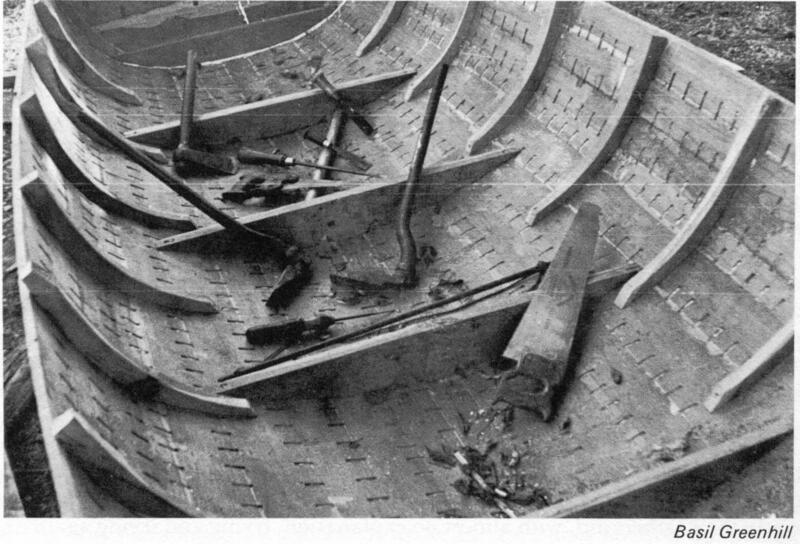 Construction begins by fastening the ends of the strakes together, then forcing the strakes apart amidships, which produces a nice curved sheerline. Then the dugout bottom is carved to shape to sit on the bottom edges of the strakes -- as Douglas Brooks noted, this is opposite to the common procedure for producing an extended dugout, in which the dugout is produced first, as a base, and then strakes are added to build up the sides. 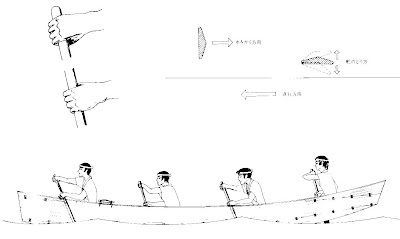 On the "it's a canoe" side of the argument, sabanis are paddled, not rowed, as shown below in the picture of a racing version of the boat, used at an annual festival in Okinawa. Note the unusual hand position on the gripless paddle: with the thumbs facing each other. Note also how the flat face of the paddle blade is not the power face. 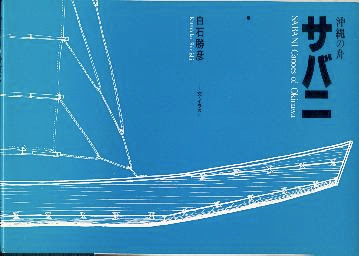 Shiraishi repeatedly stresses that, due to its narrow beam, the sabani is a fairly unstable boat, prone to capsize especially under sail. (But very pretty under sail, as the image below shows.) It is, however, fairly easy to recover from a capsize. Due to their voluminous wood construction, the raised ends have considerable buoyancy, making the canoe unstable in an inverted position as well. The boatmen turn the boat broadside to a wave and then can easily flip the boat upright. Then they turn it again to face the waves and wait for the bow to lift on a wave while then apply downward pressure on the stern, thus allowing the water to sluice out over the transom. Climb in again, and off they go. As an aid to turning the capsized boat upright, the mast is easily removed. Note how a pair of easily-removed wedges secures the mast through a square hole in the thwart. Note also the multi-position mast step, which allows the mast to be angled forward or back, depending on the point of sail. I am in Iejima, Japan, a small island that is part of Okinawa, building an eight meter sabani, working with one of the last three builders of these indigenous fishing boats. This work is supported by the Center for Wooden Boats in Seattle, the Asian Cultural Council in New York and the Nippon Foundation in Tokyo. This is my fifth apprenticeship building Japanese boats. I will keep my comments below very general as the point is to get the reader to go through my blog, where you will find more detail on history, culture, construction techniques, etc. The sabani is what we would call a semi-dugout type, and in that respect it shares a story with many similar types around the world. As the Okinawans deforested these islands the timber required to make dugout canoes became increasingly difficult to find, hence the move toward a plank-built boat that still retains some of the characteristics of the dugout. So the boat we are building has a four inch thick bottom that we have shaped from three timbers, joined together with butterfly keys and bamboo nails. Bob made a very interesting observation that sabani are built upside down, with the side planking first, and then the dugout bottom dropped on top. This is opposite of any semi-dugout traditions that either of us know, which start with the hollowed bottom and then add the side planks. It's also odd given that throughout the rest of Japan it's absolute law that boats are built right side up. I will try to ask my teacher what he thinks of this. Most of the techniques are familiar to me from my other work in Japan, but I wanted to study sabani in part because of the fastening techniques. I already have several blog posts up about the huundu, or dovetail keys, so I won't belabor that here. There will be more postings to come as we continue to use these fastenings to assemble the boat. I am certain that they are a holdover from the days of dugouts, and iron fastenings would have initially been very expensive. I am also finding that while we install them using only hand tools, it is not a slow process, so it all makes good sense, even today. 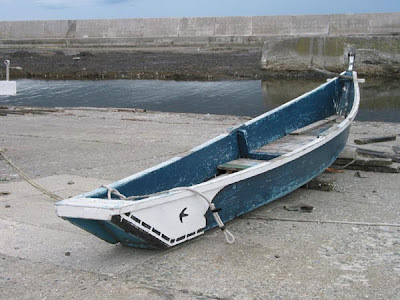 The next photo is an isobune which means inshore boat. These are still fairly common on the Aomori coast. The bottom is a single timber hollowed out, with a stem, transom, single frame and plank sides added. My teacher in Aomori told me that during his apprenticeship most of his work involved hollowing bottoms of isobune (he quit after three years of this unpaid work). Finally, we have a bekabune, or seaweed gathering boat, that I built in the Urayasu Museum with Mr. Nobuji Udagawa in 2001. 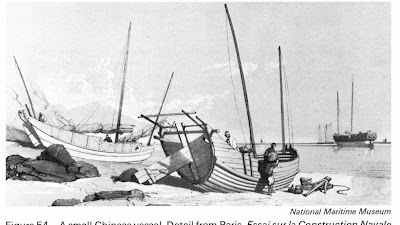 It shows the standard Japanese construction method, firmly fixing the bottom of the boat to low blocks on the shop floor braced overhead, then building the boat right side up. Props are used in lieu of clamps to hold the planking in place for fastening. The planks are edge-nailed to each other using special tools and nails. 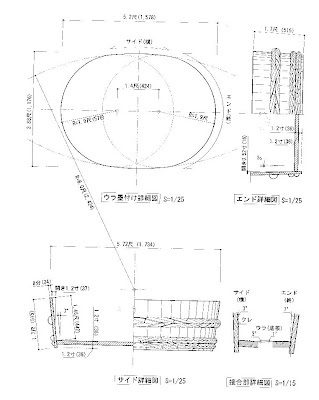 More information about Japanese boat building can be found at my website. Feel free to contact me via the website or to leave comments on my blog, The Sabini Project. I recommend Douglas's blog -- good photos and good writing, with interesting observations on the apprentice system and other aspects of culture in Japan. 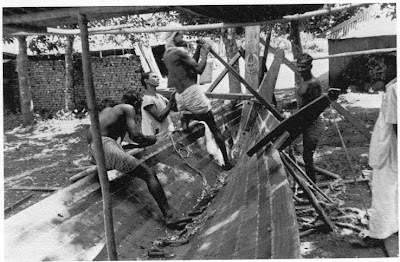 The side planks of the sabani shown under construction in his blog are not standard milled lumber. "Don't let those side planks fool you, they are CARVED. We started with 2+" thick planks and hollowed about half of the volume out of them on the inside, leaving material for thwart risers and left full thickness at the stem and transom." On the dugout-style bottom: "My teacher has specifically talked about the thick bottoms as giving these boats their stability. I have roughly calculated that the bottom alone (it's long and very narrow) represents between 40-50% of the weight of the entire boat." 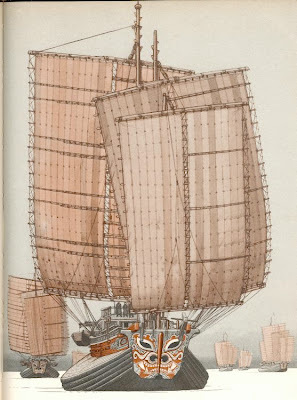 And regarding my earlier post on sabanis, which stated that the helmsman sits in the front of the boat: "I suspect is a mistake made by the Japanese writer. It just doesn't make any sense at all. And I have yet to see a sabani or harebune with a helmsman forward. By the way, those festival boats are not strictly speaking sabani, at least not today. They are plank built and considered different from sabani among the old-timers." They actually look pretty cool, and the stated purpose is to give people some of the experience of the native craft at reasonable cost and accessibility. Thanks for the link, Edwin. Edwin maintains Dark Ages Boats, which I've only just begun to look at but which looks very cool and has some bearing on what we call Indigenous Boats. I'll be spending more time there and may report back in the future. 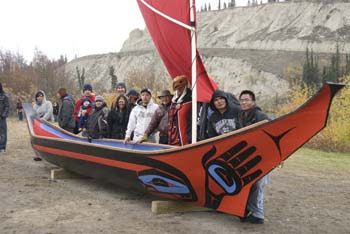 Here's a nice blog about a beautiful red cedar canoe in the Tlingit style, built as an educational project by a group of young First Nation people in the Yukon under the guidance of Tlingit Master Carver Wayne Price. 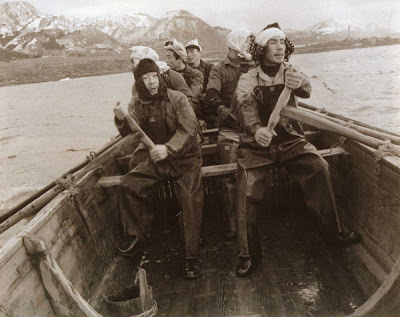 This link might come in handy to some readers: The Wooden Canoe Builders’ Guild. According to the website, "The Wooden Canoe Builders’ Guild was formed in 1997 to serve the collective needs and interests of builders and restorers of cedar canvas and woodstrip epoxy watercraft and to foster public interest in and knowledge of such watercraft." There's a good list of members, with their specialties listed, some worthwhile articles on canoe care and construction, and an impressive description of the construction standards that guild members must adhere to when building canoes. Recent trip with family to Canadian Canoe Museum in Peterborough, Ontario, was wonderful. First photo is Max and Cate flanking museum founder and canoe luminary Kirk Wipper, who showed us through and was a wonderful host. Next photo is the "figurehead" of an extraordinarily decorated 50-foot-long dugout from Irian Jaya, Indonesia (in the storage area -- not on display to general public). Follow the link to my Picasa album at the bottom for many more canoe and kayak photos. Visited the Canadian Canoe Museum in Peterborough, Ontario, today, in company with wife, son, and the museum's founder, the renowned Kirk Wipper. While there, we were shown into the new, immense storage areas by general manager John Summers. About 500 canoes in storage! A real privilege and an awe-inspiring experience. I'll post in more detail later, but just wanted to post a photo or two and report my immense good fortune. Anyone who has the opportunity to see this special museum should do so -- Peterborough is about 1.5 hours outside of Toronto. Just wanted to highlight a few nice paintings I came across recently. No lessons or points to make -- just interesting or lovely images to look at. First is this pretty, idealized Sinhalese outrigger, from Bjorn Landstrom's THE QUEST FOR INDIA . (I've cited Landstrom's wonderful boat paintings previously, here.) The artist's choice of a very low perspective does a nice job emphasizing the main hull's slenderness and rocker, and the shadows and reflections on the wet sand are so nicely rendered. Next, from the same book, is a fleet of Chinese oceangoing ships like those on which Marco Polo took the first stage of his voyage home from China some time before the year 1295. The design of the tumblehome is fascinating. 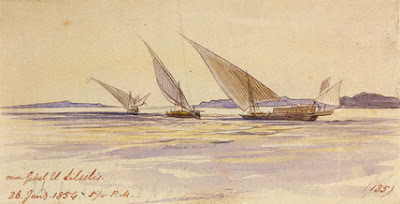 Finally, Egyptian boats from an album of images by Victorian artist and traveler Edward Lear. The images in the album are available as prints from the National Maritime Museum, Greenwich, England. Thanks to Heather Hernandez of the Maritime Compass blog for pointing out this fine resource. Yesterday's post introduced Basil Greenhill's shell-built-versus-skeleton-built typology of plank-built hull construction. Today's illustrates a few points further. 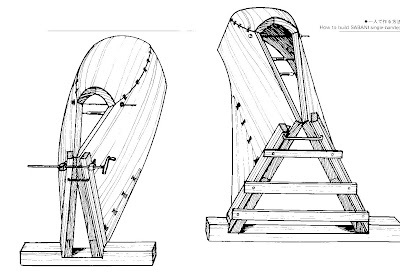 Modern lapstrake (clinker) builders set up building forms (or station molds) up on a strongback or backbone, then line off appealing plank shapes, spile the shapes, and then cut the planks to fit properly on the form. This presupposed the existence of carefully drawn plans that can be scaled up to full size, and/or accurate tables of offsets. 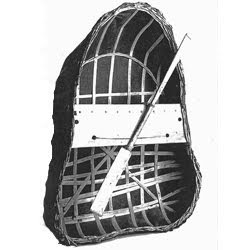 The traditional clinker builder, in both the Western and non-western traditions, had no such plans or tables -- nothing upon which to base station molds. It was the plank shape that came first, and the boat took shape as those planks were assembled. While most builders relied on memory to copy the plank shapes of their teachers, it must have taken an extraordinary mind to modify the shape of a hull for any reason, for this would require visualizing the shapes of the planks needed to form the hull. Even as simple a boat as a banks dory has very surprisingly-shaped strakes, if you see them "unwrapped" from the hull, and the notion that builders could properly visualize the plank shapes needed for, say, a round-bottomed hull of wide beam, with a hollow entry, spoon-shaped bow, and a tucked-up transom stern -- well, just try and do that without CAD. But do it they did. Shown below are a couple examples. The first, at the National Maritime Museum (Greenwich, England), was a demonstration to show how it was done without forms. The builder did use a few half-molds, but these were simply held in place by hand, temporarily, to check how the hull was developing. Planks were not bent around them. 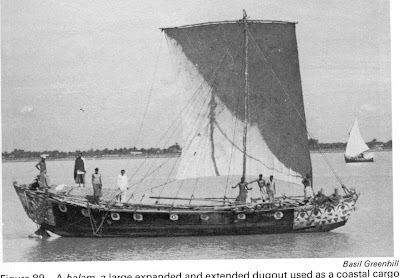 The next example is a Bengladeshi boat, similar to the hull shown in yesterday's post. Note the copious use of clamps and shores to hold strakes in place while they're fastened. 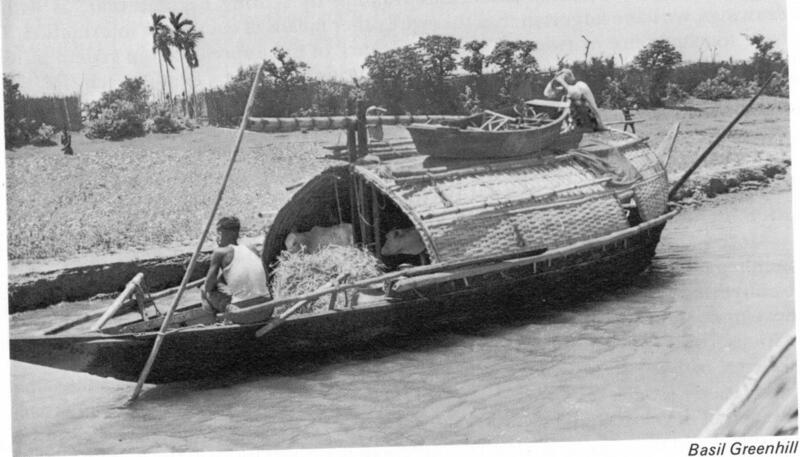 The following photo shows a typical, mostly frameless, Bengladeshi working boat built by the method shown above. Finally, we see a variety of planking styles used to extend (raise) the sides of a dugout canoe. These same planking methods continued to be used after the dugout base had atrophied into a keel. 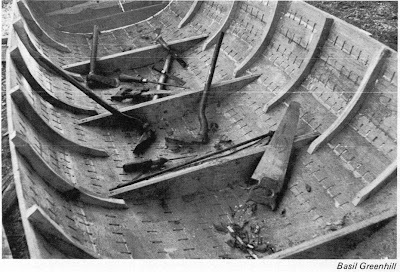 All are examples of what Greenhill described as "edge-joined" planking and, whether lapped or smooth, were methods used to build shell-built hulls. It's been over a month since my last substantive post, and I must apologize to my reader/s for the blackout. No problems other than being busy, but who isn't? 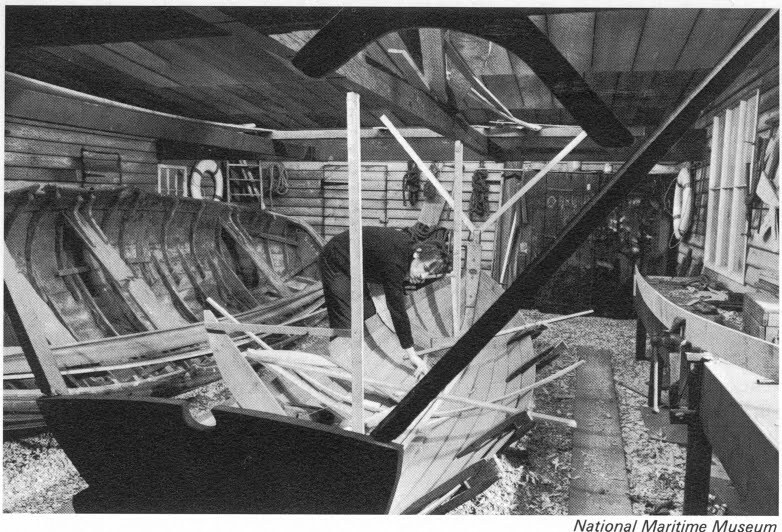 In September, I discussed Basil Greenhill's "four roots of boatbuilding" as described in his Archaeology of the Boat. 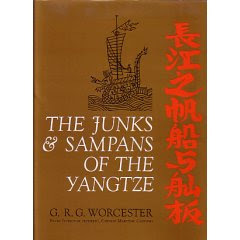 Another important theme of this book is the typology of boats based on their planking styles. In the Western tradition, we're accustomed to thinking of everything in terms of smooth-skinned versus overlapping planks -- also known as carvel versus lapstrake (a.k.a. clinker). But looking at boatbuilding from a broader cultural perspective, this is not a very useful distinction. 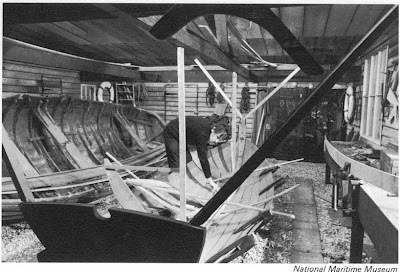 Modern builders of traditional western boat types do much of the setup the same way, regardless of whether they're building carvel or lapstrake: first you set up building forms or sawn frames; then you bend planks around the forms or frames. Then if you were using forms, you replace them with frames. But this wasn't always the case. The lapstrake tradition is by far the older one in western culture and, in contrast to modern methods, building forms and sawn frames were not used. This is because builders did not work from plans, and did not envision the boat as a series of sections or half-breadths. Rather, they viewed the boat as a shell. 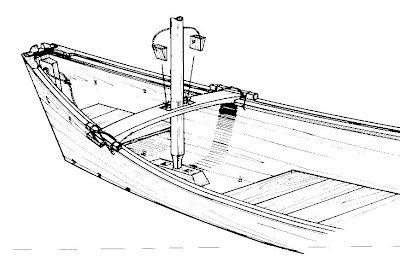 Plank shapes were the starting point, and through experience, ancient builders could envision how a collection or series of plank shapes would go together to create a boat of a given shape. The planks were, in Greenhill's terminology, "edge-joined" to one another to create the shell or envelope, and only then was an internal structure inserted. But beware the term "edge-joined" in the paragraph above. These were lapstrake boats, and the planks were not set "edge to edge" carvel-style. The edges did in fact overlap, lapstrake-style. By "edge joined," Greenhill means that the planks are structurally connected to one another to create the shape of the hull. This, then, is a clear contrast to carvel planking, in which the planks are not attached to each other at all but, rather, are attached to the frames for structural integrity. So Greenhill largely divides plank-built boats into edge-joined, i.e., "shell-built" hulls, and non-edge-joined, i.e., skeleton-built hulls. This proves to be a far more useful way of looking at boats archaeologically and cross-culturally, because many cultures use (or used) edge-joined planking methods that result in a smooth outer skin. 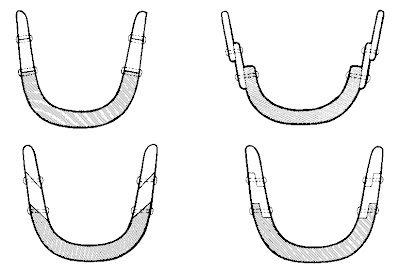 This involves the use of a variety of overlapping methods, one of which is shown below in images from Greenhill's book. 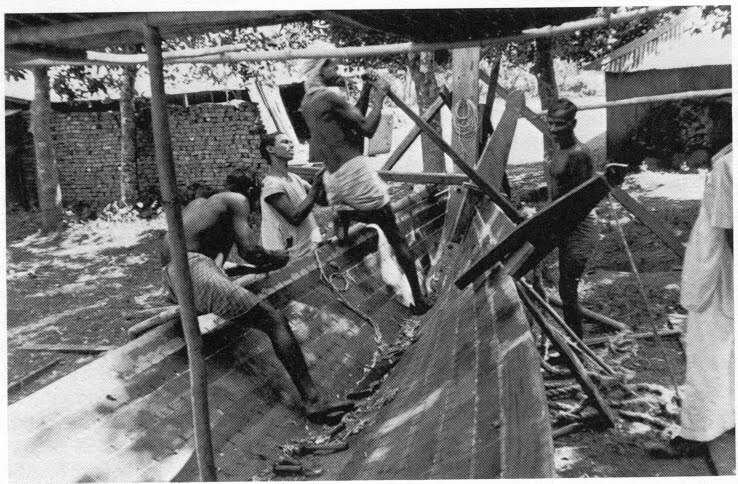 The images show a common planking method of Bengladesh. Note the full-length rabbet between the planks, which are joined by iron staples set into mortises on both sides. After the entire shell is thus assembled, frames are added to the inside. As shown in the photo, frames across the bottom (i.e., floors) often do not even touch frame members up the sides. The shell provides the majority of its own structural integrity, and the frames are reinforcements, but not essential structure as in a carvel hull's skeleton. Greenhill diagrams about two dozen shell-forming methods (unfortunately, the book's graphic doesn't scan well for the web), with a great variety of plank-joint styles (e.g., rabbeted/smooth- skinned, normal lapstrake; reverse-lapstrake [in which the lower plank's upper edge is outside of the upper plank's lower edge]; strip-planking, bevelled/smooth-skinned, flat, flush smooth skinned, and more) and fastening methods (e.g., mortised staples, sewing or stitching, edge-nailing or dowelling, etc.). It's clear that the majority of plank-built boats in what I refer to as indigenous traditions rely on edge-joining/shell-built technology. Viewing all plank-built boats from this perspective opens up one's understanding of boatbuilding far beyond the carvel-vs.-clinker duology. 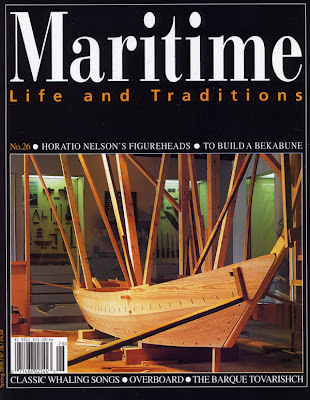 One can therefore see the Chesapeake Bay log canoe (western culture, yes, but outside the norms of the western boatbuilding tradition) in a new light: although the topsides planks conventionally meet the boat's stem and stern, the bottom planks run parallel to each other, their ends curving up to meet the bottom edge of the lowest topsides plank rather than curving inward toward stem or sternpost. The evolution of this type makes sense: originally it was truly a log canoe. It was expanded laterally by adding additional logs; the logs were hollowed out and, over stages, became not hollowed logs but planks -- but they were still joined edge-to-edge to make the shell. Eventually, topsides strakes were added in what has now become the traditional carvel style.